This Feather and Rhinestone Pin DIY is the perfect accessory to any holiday outfit. 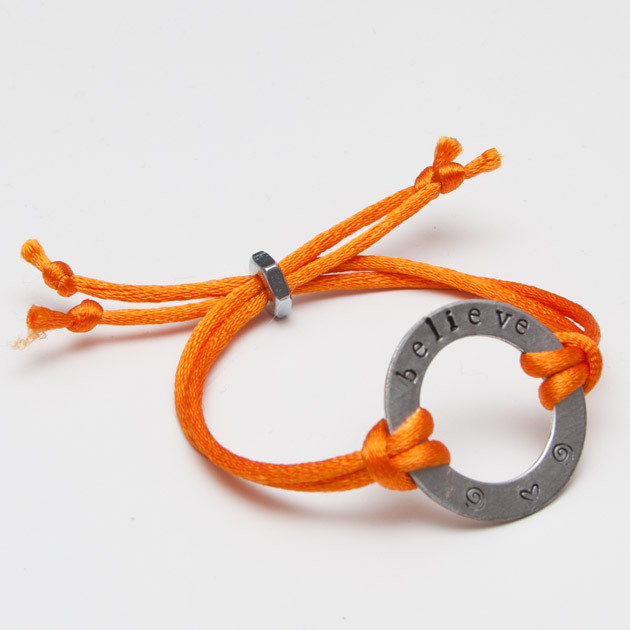 It’s very simple to create and makes a stunning statement. 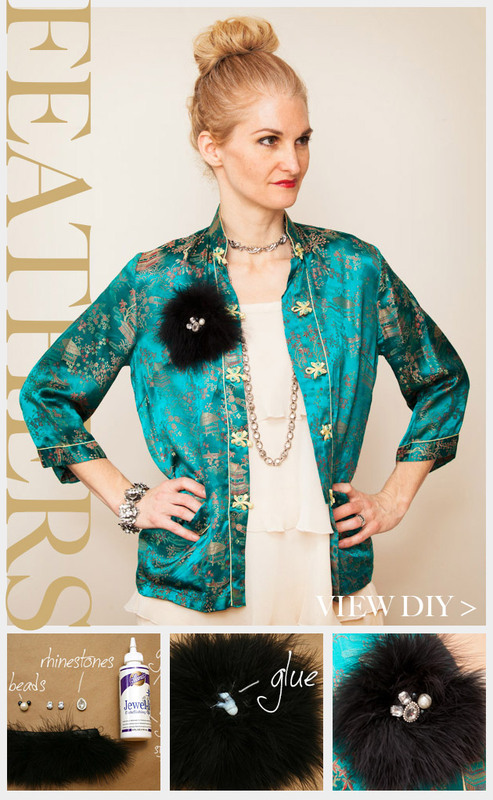 Take your marabou feather trim and your hot glue gun, carefully make accordion folds with the edge of your feather trim and secure it with your hot glue as you go. Continue folding and gluing your feather trim forming it into a circle as you go. 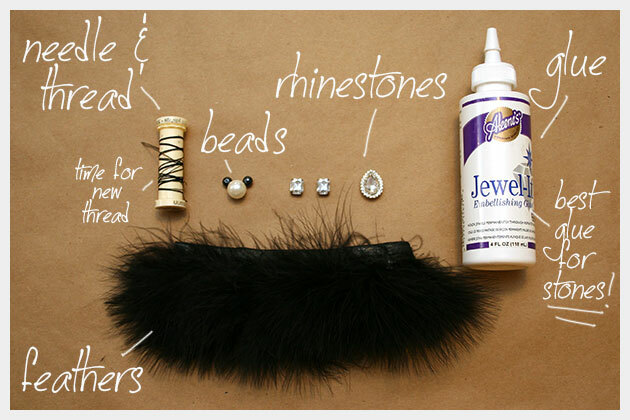 Once your feathers are in a circle and your glue has dried, you can layout your rhinestones and beads to see where you want to place them. When you have your placement, take your Aleene’s Jewel-it and place a few drops in the center of your feather circle where you want your stones to be. If your stones have a metal backing wait about 10 minutes before putting them on the glue. For your beads you can add them to the Jewel-it glue right away. You can also use your needle and thread to sew your beads on. Sometimes it’s difficult to sew through where you hot glued your feather trim. I did not sew my beads. I feel pretty secure that the Jewel-it glue will hold me. I’ve had very good luck with this glue. Once all your stones and beads are securely glued and the glue had dried you can add your pin back or safety pin to the back of your feather circle. I used hot glue to to glue my safety pin to the back of the feather circle. 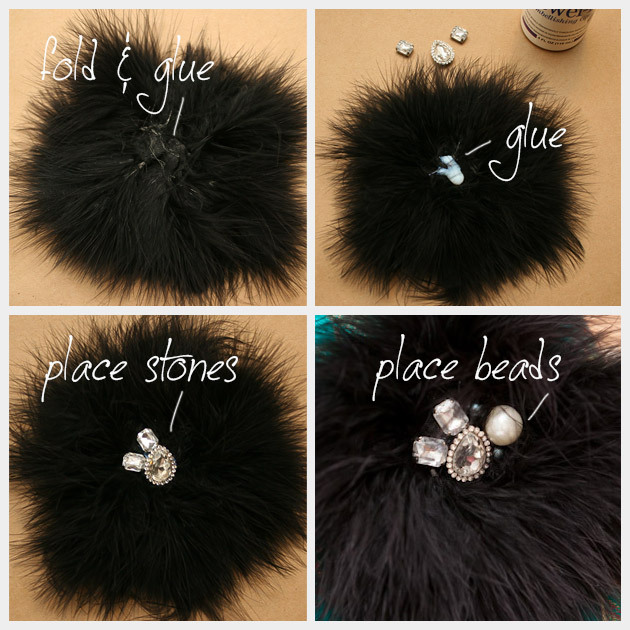 I was inspired to make this Feather and Rhinestone Pin DIY from this Ostrich Feather pin from Bando at Anthropologie. They no longer have them on their site, but I do have them available at my new Etsy store, it just opened today! Check it out and let me know what you think. 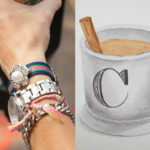 This is a great project to make as a gift for the holidays or for yourself. Leave me a comment and let me know how yours turned out.